Sono molto felice di annunciarvi la mia prima apparizione da guest blogger in veste di padrona di casa del Daily Pinner. Ad invitarmi e offrirmi questa bella possibilità è una collega e amica di Cagliari, Carla Monticelli. E visto che lei ha la fortuna di vivere in una della città più belle d’Italia, ho compilato una breve serie di importantissimi motivi per scegliere Cagliari come casa. Siete curiosi? Allora fiondatevi sul blog di Anakina, e buona lettura! Today I’d like to translate an article I wrote as a guest blogger for Anakina Blog, the webspace of a great fellow and friend of mine, Carla Monticelli. 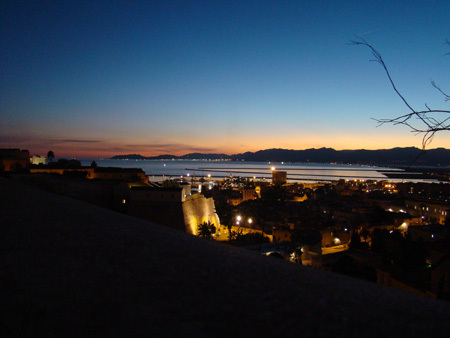 I have stated several times around the blogosphere that I would not mind move to Cagliari one day. And if it may seems logical and natural for many Cagliari citizens or “adopted” ones, for many it is not. Then I have listed five, quick, good reasons why put it immediately to the signature move in the capital of the island. 1) The awesome climate. If you are cold-blooded animals like me, Cagliari is a city (pretty much) without winter. Apart from the wind that often blows cold, there is no sign of frost, ice, snow. It is true, in summer the heat is humid and the mosquitoes can weigh as much as chihuahua puppies, but they are circumstances in which you can live with. With the cold you don’t live, you suffer. 2) Parks and gardens. Cagliari is full of green and accessible spaces for outdoor activities. Wanna a list? Colle San Michele, Monte Urpinu, Monte Claro, the Lighthouse of St. Elias and gardens and other gardens. Are you run-addicted just like me? The city is full of paths for runners and sports facilities as the athletics stadium in Sa Duchessa area, the Amsicora’s one – when I will come to Cagliari I will surely try the hockey – and the stadium in Viale Diaz. 3) Art and history. For ‘art’ I don’t just mean the big museums, but also walk in the historical center of Cagliari, with its lovely promenade which is one of the most beautiful in the whole Italy. Besides, you need to go just a few kilometers outside the city to dip into the ancient history: the Phoenicians, Aragon, Romans, Pisans, and more. If you say ‘Cagliari’, you totally say ‘history’. 4) Cultural events. I’m surely not a ballet-and-opera-girl, but knowing that Cagliari has a prestigious theater gives me a sort of “confidence”. All-accomplished cultural events embrace Cagliari like a wise mother: from exhibitions to gigs and conferences, the city pulses of initiatives. And where there is no culture, there is no life at all. 5) The Sea and the Flamingos. Discounted, you’re right, that’s so true. Nevertheless having the beach just minutes from home is a priceless feeling for me. In addition to the long beach Poetto there are lots of slice of heaven a few kilometers by road. I also see the flamingos every time I’m coming in Cagliari, as they seasonally inhabit the ponds of the city. Once – while I was stuck in traffic – I saw a small flock of pink flamingos flying over my head, so I understand what is the difference between the major cities of the world and Cagliari.